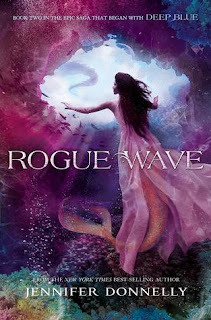 I've been holding off on this post, because I'm on a waiting list for the library to either buy or borrow #4, Sea Spell. So far, neither has happened, and there are big projects going on at the library right now (parking lot reno followed by carpet replacement), so the upshot is--I'm giving you what I've got, and a review for #4 will have to come later. I could buy it on kindle for $9.99, but I don't want to buy just #4, plus I'm a cheapskate. 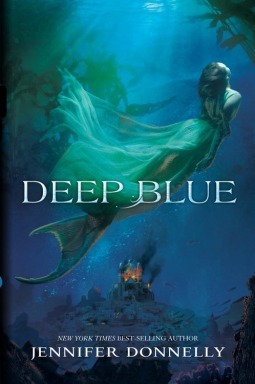 I picked up Deep Blue on a whim, when I saw it was a Young Reader's Choice Nominee for next year. It took me awhile to make the connection with the author--I didn't know Donnelly wrote mermaid books! The only other thing of hers I've read is A Northern Light, which was historical fiction. It's been so long, I'd have to re-read it before I could review it, but it won a Printz Honor Award in 2004. Anyway, I was a bit surprised, that's all. That's just the beginning. There's actually history of how the Mer people came to be, political and cultural traditions, different Mer realms with their own intermingled histories, creatures both real and ghostly, and a unique magic system based on singing. You can tell Donnelly really put some time and thought into creating this world. Granted, this is not high literature, and keep in mind that these were still written for a teen audience. Some of the dialogue made me roll my eyes a bit, and in some places it felt like Donnelly tried too hard to have a comparable teen culture under the sea. For the most part, though, I was impressed! 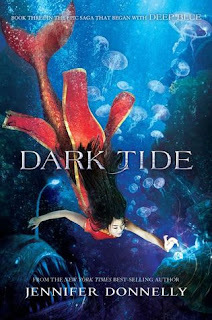 If you like mermaid stories, or think you might like them, I would definitely give these a try. 4 stars: I was impressed by the depth of world building, and kept reading for the action! Serafina--a mermaid--is the daughter of the reigning regina of the Mer realm Miromara. She's had some very strange dreams lately. Dreams of the Iele, or river witches, and a terrible monster trying to break free from its cage. The witches were telling her that she must come to the River Olt with 5 others, to help battle the monster. The only thing is, Iele are make believe. At least, as far as Serafina knows. Meanwhile, it's not like she has nothing else to do. As the crown passes from mother to daughter, that means she's next in line for the throne. Her Dokimi--a 2-part ceremony to determine her fitness for the throne--is coming tonight. She still has parts of the tricky songspell to practice, and her betrothed is coming for the Dokimi as well--she might get to see him. Although, from what she's heard over the past few years, she's not sure she even wants to anymore. It seems he has turned into a party boy since the last time they were together. During the Dokimi everything goes according to plan, right up until an arrow comes out of no-where and hits her mother seated on the throne. Instantly the entire court is thrown into chaos. Before Serafina even really knows what's happening there are soldiers wearing black down every hallway, her father is killed right in front of her, and dragons begin smashing down the castle walls. She escapes from the castle with her best friend Neely. It turns out Neely has had the same terrifying dreams. After trying to go for help and getting captured, the two eventually head for the River Olt; in fact, they feel compelled to do so. What they find there will change both of their lives forever. Serafina's a strong character who doesn't know her own strength yet. Perfect for a teen audience! As her whole world comes crashing down around her, she makes the best choices she can in difficult circumstances, and slowly comes to realize her potential to be a leader, like her mother was. Content: Violence via Death Riders. Otherwise clean. 3 stars: Choices, journeys, and battles--both inward and outward. Serafina and 4 of the other 5 mermaids summoned to the River Olt are now bound by a blood oath to defeat the monster Abbadon. All 6 of them are direct descendants of the 6 powerful mages in Atlantis, who ruled the people anciently. The 6 teenage mermaids have the potential to become like their ancestors in strength and magical abilities. It's going to have to happen soon, though. Abbadon is going to break free from his cage and wreak havoc on the entire world, unless someone unlocks the gate and kills him. Or 6 someones, in this case. In order to do so, there are 6 talismans that they must find, each a key to unlocking the prison where the monster lives. First though, they have to find out what the talismans are, where they were hidden, and then--you know--actually find them. All the oceans and waterways of the world are possible hiding places. Okay go! It pretty much feels impossible. However, Serafina has at least a couple of starting places in mind: first, the sunken city of Atlantis itself. Perhaps there are clues amongst the ruins that will shed some light. Of course, Atlantis is now populated by cannibalistic sea creatures called Opifago. Better watch out for those. Another place to look is at home in the good old library--or Ostrokon--where there are conches filled with history. She remembers learning about her ancestor-mage, Merrow, who made a trip around the world. What if she was hiding talismans while she was at it? They must figure this out! Everything depends on it. Meanwhile, back at home, there's a resistance movement growing called the Black Fins. Serafina really wants to stay and help fight the usurpers who have taken over her mother's throne, and protect her people--what's left of them--as well. So many choices, so little time. This time the narrative is split between Serafina's journey and Neely's. I know, my summary hardly mentioned Neely. Here you go: Neely goes home and gets locked in her room, because her parents think she is mentally unstable after hearing her story and seeing how she's changed. Finally she escapes and goes to look for her talisman. Better? Anyway, good for a second novel. Faint praise, I realize. I think writing a second novel as strong as the first must be one of the hardest things to accomplish in fiction writing. In a fantasy world, especially, the newness of the setting has worn off by book 2, so any filler plot-wise shows up more starkly. Thankfully, it's not all wandering and endless searching for mysterious talismans. Enough subplots continue to develop to keep the story moving forward. A few twists thrown in to keep things interesting, as well. I appreciated the way Serafina kept learning and gaining confidence her ability to make decisions and lead others, "playing the board and not just the piece," as her mother taught her. Content: Some violence, but the romance stays sweet. Serafina has found her talisman (sorry if that was a spoiler), so now she's free to lead the Black Fin Resistance against those in the palace--who shall not be named for spoilerish reasons. The BFR needs gold--lots of it--in order to survive, and also to buy some allies up north and raise an army. The BFR has discovered a way into the palace treasury...if they can pull it off. Big plans. Meanwhile, the search goes on for the other talismans. Astrid returns home to find her father on the brink of death, an arranged marriage in the works for her, and political intrigue as thick as thieves in the palace. Ling's been captured by their common enemy and is on her way to a work camp at the edge of the Great Abyss. Becca is also on the run, but manages to hook up with Astrid for a time--long enough to learn Astrid's shameful secret. Ava also heads back home, only to find an unpleasant surprise waiting for her there, as well. This was a stronger addition to the series than book 2. After 2 books mostly focusing on Serafina and a little on Neely, we finally got a little more backstory on the other 4 mermaids that haven't played as big a part yet: Astrid, Becca, Ling, and Ava. We also got a closer look at the villains; their methods and motivations. Some other reviewers thought the switching POV's made it too choppy, but I liked the way it kept the plot progressing, and didn't have any trouble following. Serafina continued to show growth as a character (also hard to sustain in a series). For the others in the bloodbind, they at least made some progress toward getting answers, whether or not they liked those answers. At the same time, a few more romantic entanglements started simmering in this one. It will be interesting to see where they all end up in the last book. Content: Some creepy parts with a couple of the villains, again some violence, clean romance. Still teen appropriate. Once I get my hands on Sea Spell, I will let you know how it caps it all off!